I love the Mazza Museum Summer Conference! 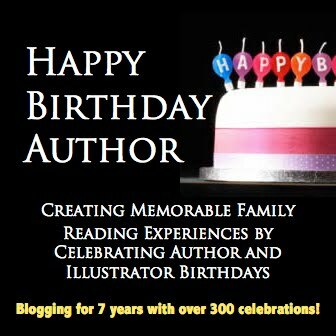 It is an event that offers me opportunities to improve as a writer, fulfills my need to learn more about picture books and their creators, and provides time to be with people just like me! 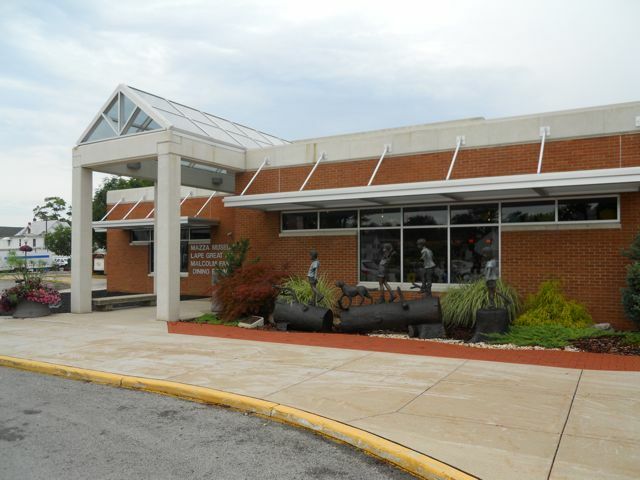 The Mazza Museum is located on the campus of the University of Findlay in Findlay, Ohio. It is the home to the one of the largest collections of original art from picture books in the world. 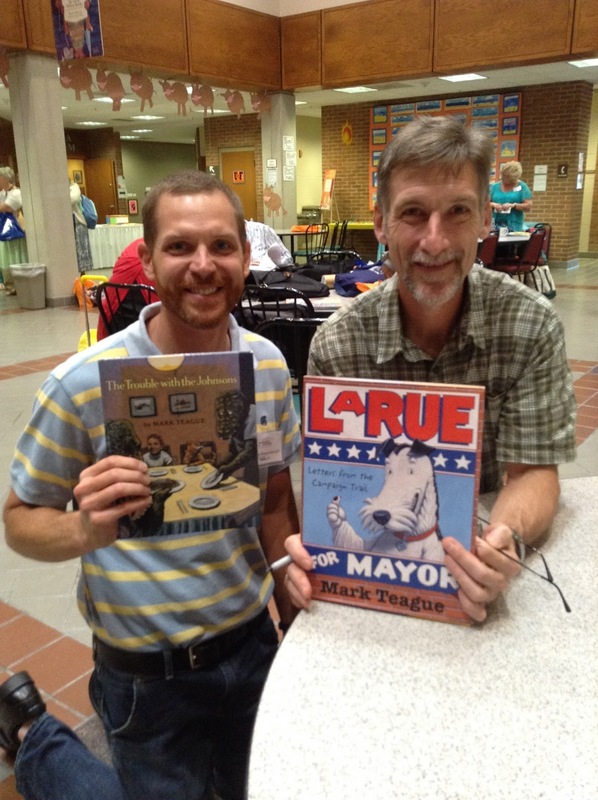 Every summer, it hosts a conference for teachers, librarians, and people who love picture books. 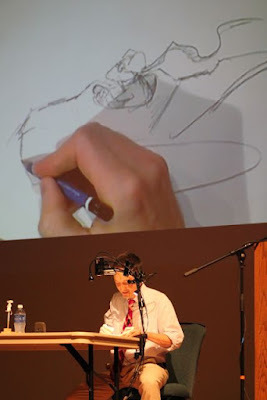 Throughout the week attendees are treated to keynote speeches from best children's book creators, pull-out presentations from passionate teachers, and plenty of time to socialize (evening dinners with the artists are so much fun!). 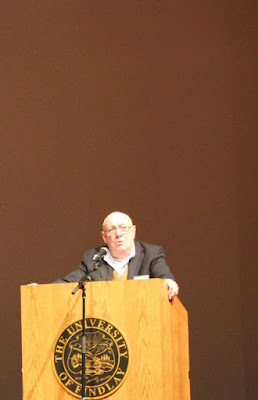 I attended the summer conference for the first time in 2011. My wife surprised me with registration for the conference for my birthday. It is probably the best birthday gift I have ever received. I have returned every summer and plan to return every year in the future. The Mazza Museum is located within the Gardner Fine Arts Pavilion. There is an amazing gift shop, too! Original picture book art covers the walls. 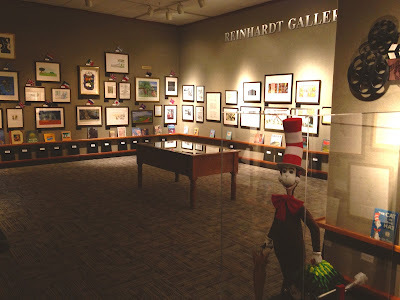 This picture shows a fraction of the displayed art. There is always a variety of new pieces displayed each summer! This year there was art from modern graphic novels, award-winning picture books, and vintage children's books. Coming in Fall 2015 is a new exhibit dedicated to paper engineering and pop-up books! 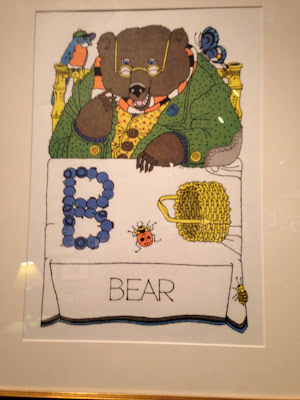 Every year I find there is one piece of art that catches my eye each time I walk through museum. This year, it was this piece by Ed Emberley. Four out of the five years I have attended the summer conference I have participated in the writing strand. 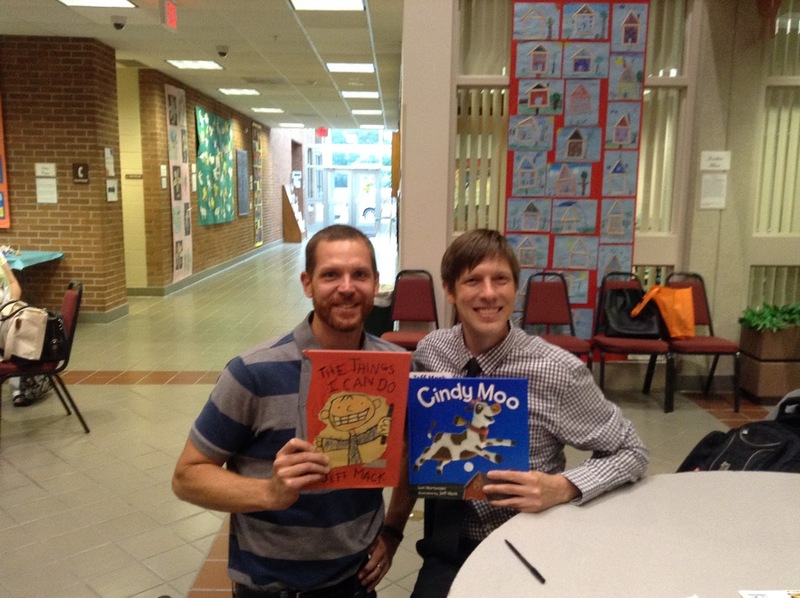 This option is a one-of-a-kind opportunity for aspiring children's picture book writers. 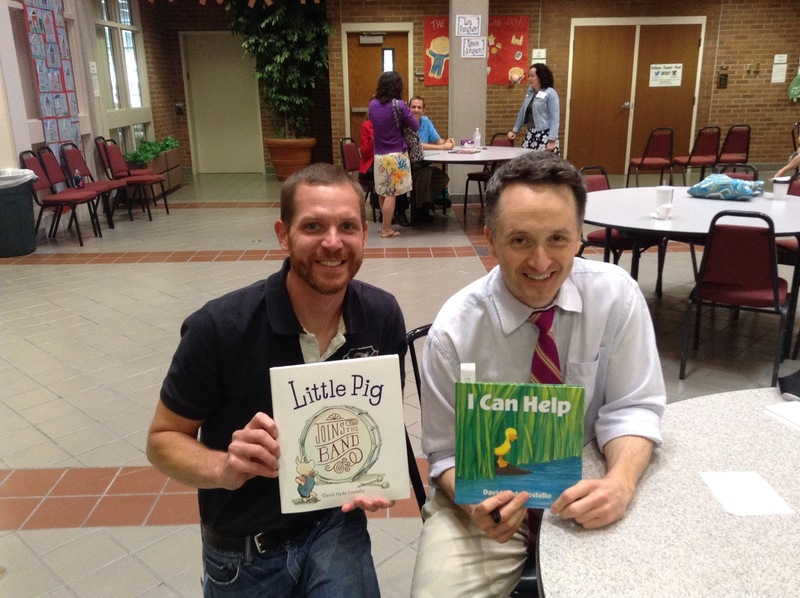 By enrolling in this option you meet with an experienced children's book author instead of attending the conference pull-out presentations. 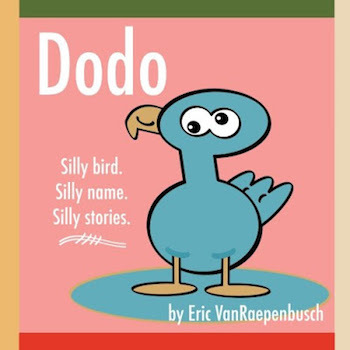 Therefore, you receive 7-8 hours of instruction about picture book writing and a critique opportunity for your own writing!!! I feel the writing strand is the hidden gem of the conference. I would pay the $225 to attend the conference, see the keynotes, and get autographs. I feel the writing strand is like getting a FREE bonus gift! Two years ago, Michael J. Rosen was the author teaching the writing strand. 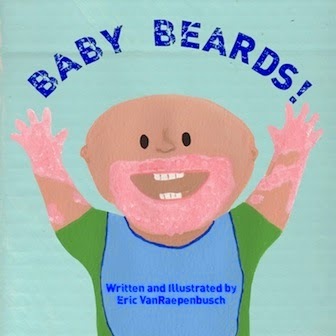 He provided activities and advice that helped me write and design my book, BABY BEARDS!. 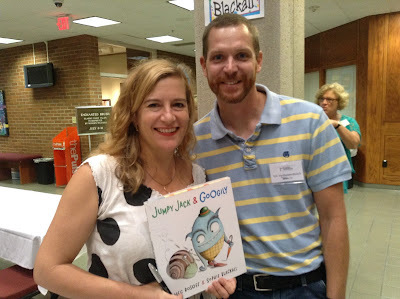 This year, Shutta Crum taught the writing strand and she gave me many ideas that greatly improved my latest picture book idea. 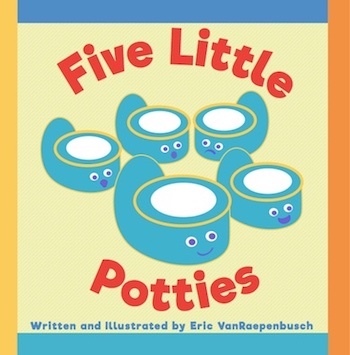 I was one of fourteen aspiring children's book writers in the class. We learned so much from Shutta! She really knows children's books! 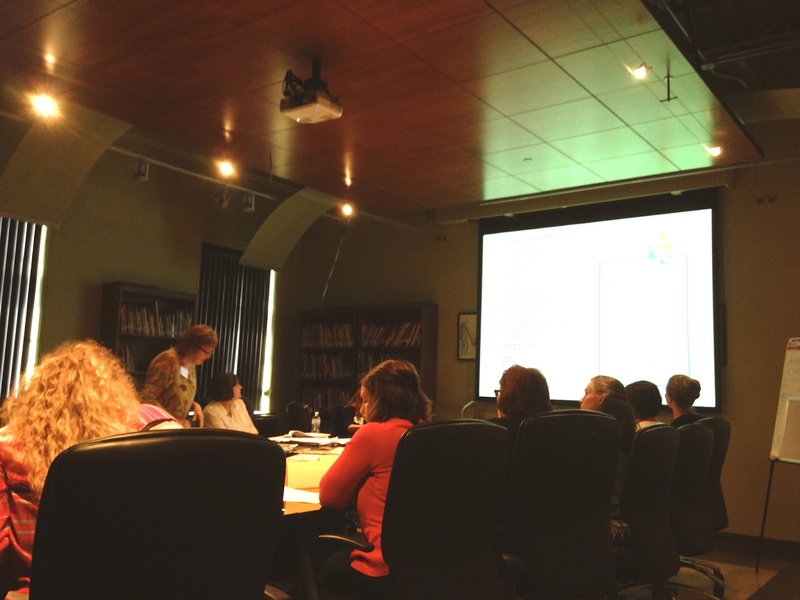 Not only do you learn about writing and developing picture books in the writing strand, but each author and illustrator gives you a glimpse into their process. 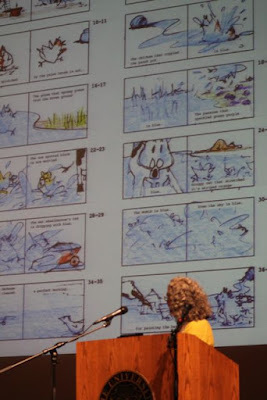 In this photo, Deborah Freedman shares the storyboard for her book, BLUE CHICKEN. 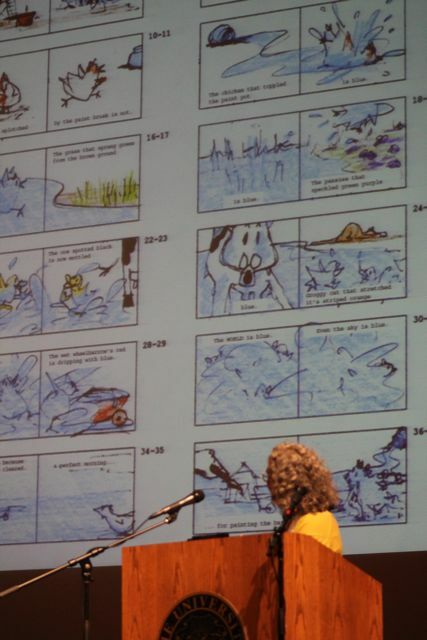 The writing strand and the keynotes offer an unmeasurable amount of inspiration! The keynote presentations have been simply amazing every year. Conference attendees always say the same thing, Monday's presentations were great. Tuesdays were great too. Can this week get any better?. Guess what? It always does. By the end of the week your mind is blown by what you have seen, what you have heard, and how much you have learned. Every presentation is unique. 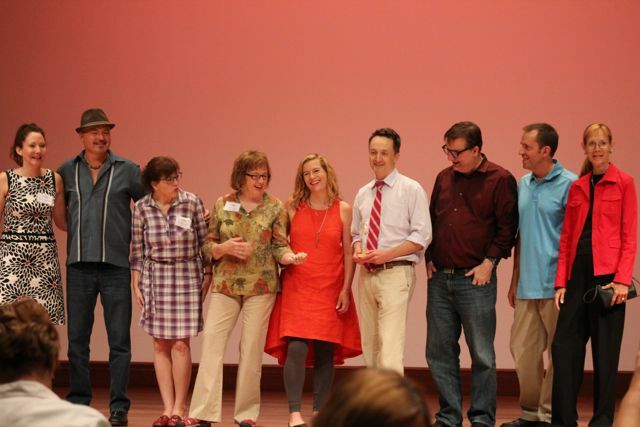 This year, David Hyde Costello wowed us with his improv illustrating and storytelling. It is amazing to see this much talent in one week. (Pictured: Sherri Duskey Rinker, Rafael Lopez, Michelle Houts, Shutta Crum, Sophie Blackall, David Hyde Costello, Kevin Cordi, Steve Johnson, and Lou Fancher.) And this wasn't even the whole group! Everyone who attends the conference is excited to get their picture books autographed. However, some are more excited than others (I am not going to name anyone in particular --- ok, ME!). I plan well in advance and come with boxes of books to get autographed. 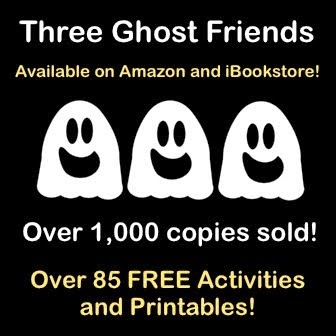 All of the books are gifts for my nieces, nephews, cousins, and my own children. Despite having boxes of books, I always end up making a few purchases at the Mazza Gift Shop, too! I started off the week meeting Jeff Mack! 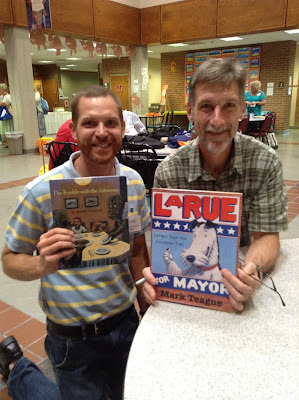 This wasn't the first time I met Mark Teague, but I recently found his first book, THE TROUBLE WITH THE JOHNSONS. I was excited to get it autographed. A highlight of the week was meeting Sophie Blackall. Every year, there is always one author/illustrator that I am not familiar with but walk away from the conference a huge fan of their work. This year, David Hyde Costello was that author/illustrator for me! 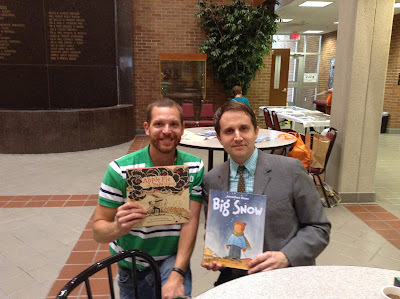 I love all of Adam Rex's picture books. I am so thankful to have spent time with him this week. 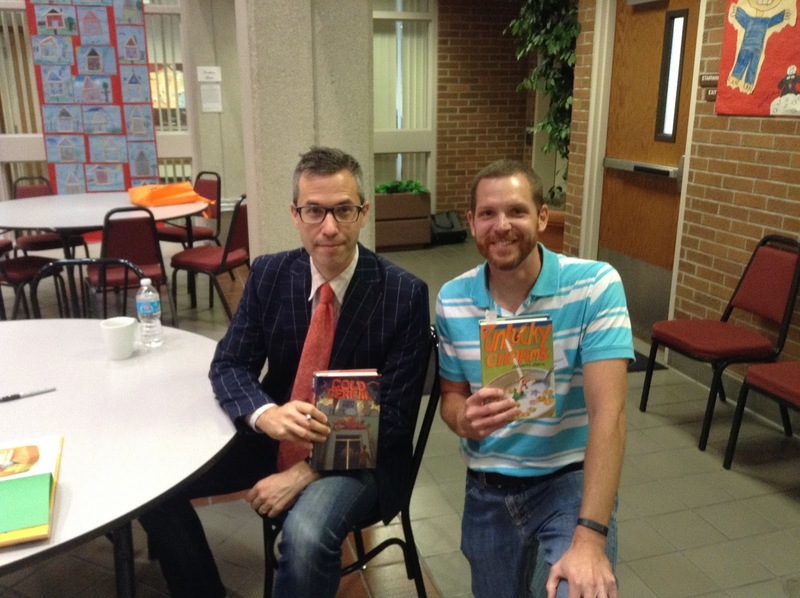 The last day of the conference brought us the amazing Aaron Becker! And Jonathan Bean! Wow! What a week! There is no other place or event that I have encountered that makes me feel as welcome, understood, comfortable, and happy. 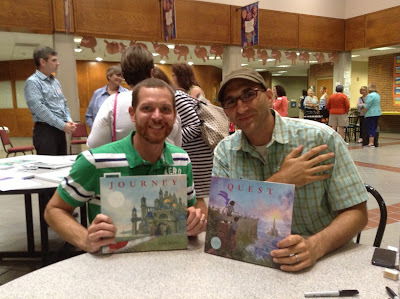 Every person shares the same love and passion for picture books. All of us want to learn more, see more, and read more. The Mazza Museum Summer Conference recharges us, supplies us, and energizes us with the knowledge "to do what we do" which is teach, inspire, and guide children and families to embrace reading picture books. None of us want the week-long conference to come to an end. We always leave fulfilled, yet we are always looking forward to the next conference. Sadly, when I return to Mazza there will be someone missing. It is hard to even imagine what it will be like without him. When I saw the news in an email, I shouted, "NO!" I thought, I just saw him two days ago!. Before I left for home, Jerry and I were joking around like we had done all week. We acted as if we would see each other again very soon. I never thought the hug that he gave me was going to be the last one. Dr. Jerry Mallett built a place that I want to visit more than any other place on Earth. His museum is filled with everything I love. His museum brings together people who inspire me and make me happy. 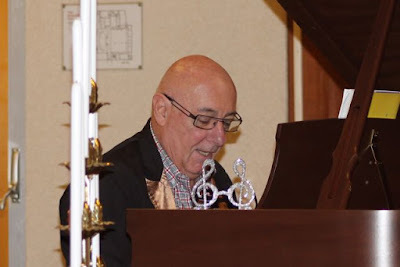 I feel blessed to have known him. 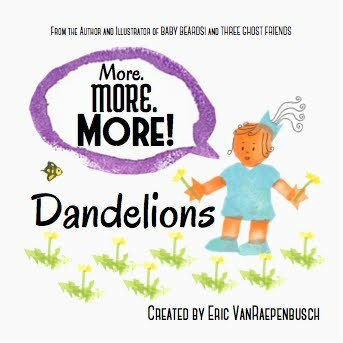 He provided wisdom, advice, encouragement, and experiences that I will carry with me as I continue to grow as a picture book advocate, a writer, and a person. Thank you, Jerry! I will miss you!